Our OMQG president is having her first baby soon, so I wanted to make her a sleep sack. I looooooved using sleep sacks for my kids, and I never would have known about them if my mom hadn’t given me a couple. Uptown/downtown dress for my babies! In December, I found the uptown/downtown dress pattern, and I love it so much! It makes an adoooorable little baby dress, it’s quick and easy to sew (I like kiddie things to be fast makes since they get outgrown so quickly), there are a lot of modifications included (great for me, who has no fashion imagination), and it’s a super price (hehehe). For my sister’s daughter my other baby, I made a 2T but chopped it to a t-shirt length since she’s only 1 year old and isn’t walking yet. Hopefully that’s why it fits a bit oddly around the neck, and it’ll get better as she grows into it. I’m a huuuuge dork and forgot to take a good-camera picture, but on Christmas afternoon, I remembered that I wanted to make a matchy Christmas dress for Glowbug and managed to sew this in time for dinner. (Sorry for the blurriness — it’s the best one I have. >_<) hehehe, matchy Christmas outfits! These were made out of stash scraps — both of the linen exteriors were left over from when I made wrap pods (oops, there’s only a picture of one here) and the linings were whatever else I had that was already washed. I decorated them with bits I cut off of clothes Glowbug had outgrown. I love these bunnies! The little rhino on this was from some onesies that my (super awesome) sister made her own little appliques for. I’m going to keep cutting off and saving that rhino as she outgrows her clothes! After a month I’ve finally finished making a diaper bag for my sister’s third-baby-present. That’s what I get for not buying a pattern. I made the diaper bag she’s currently using a couple of years ago when I didn’t know much about making bags (the crossbody strap isn’t adjustable! ), so I wanted her to have a nicer one. I couldn’t find a pattern to buy that I liked, so I looked for a real bag to copy and landed on Petunia Pickle Bottom’s Wistful Weekender. I know, I’m such a meanie! I use my sewing abilities for evil. Anyway, I spent a couple of days making pattern pieces out of butcher paper. Then I was going to be good and make a test bag out of the small cuts of the Jessica Jones canvas I already had… but partway through sewing it together, I knew I’d never want to make a second one, so my sister was going to get this funny version. On to features! There are three ribbon loopies for keys/binkies/other dangly things — one each for the exterior pockets and one in the bag. The snap tabs on the ends allow the bag to kind of cinch up smallerhugish or open up to gargantuanhuge. There are ten interior pockets: four gathered pockets (two on each end), four regular patch pockets (two on each long side), and two zippered pockets. It’s pocketastic in there! After a ton of overthinking, I put in the separating zipper flappies that the original has. I got the zipper from zipperstop, sewed each side into 3″ wide flaps, sewed the flaps to the interior fabric, and then covered the raw edges with cotton tape. It took less time than I had spent thinking about it. I wanted to give the bottom a little support without making it too heavy, so after assembling the exterior, I sewed a plastic cutting board (cut down to the curvy shape) between two pieces of heavy sew-in interfacing, and then sewed that whole sandwich to the bottom of the bag. It’s oooookay… it strikes the right balance between structure and weight for me, but it is still pretty bendy. I did a ton of top-stitching — I sewed two lines outside of every seam, including the seams in the lining. I was so pleased with myself… until I realized (after finishing the exterior and lining) that I’d left myself no way to turn the bag. As it happens, I wouldn’t have been able to do the turny-right-side-out way anyway because of the way I made the pattern pieces. Fortunately, the quilt binding-ey finish doesn’t look too crazy. But that’s not what I have pictures of — here’s more proof of top-stitching! Also, piping! The actual making of piping doesn’t bother me, but the amount of fabric I have to cut up to make it does. I can’t argue that piping doesn’t make bags look better, though, so I put on. I didn’t cut the piping fabric on the bias, but I think that actually would have worked out okay if I hadn’t also been double dumb and used twine that was not thick enough for the cording instead of the actual good piping cording that I have but still chose not to use. guh. Last of all, I made a regular old adjustable cross-body strap that can hook onto the metal rings for the shoulder straps. I dithered a ton about whether to make dedicated stroller straps, but decided they weren’t necessary — Mr. Yazoo forgets that we even have them on our bag and just uses the cross-body strap to hang it over the stroller. The bag is supposed to be 17″ wide x 12″ high x 13″ deep, but it sure feels huge. You can put a baby in it! Or you could be a normal person and not get arrested for carrying your baby in a bag. Just in time for his first birthday this weekend, I finished the quilt meant for my nephew’s actual birth! It was my July ALYoF goal and also one of my strategies for stretching my crafting money (finishing wips to stave off starting quite so many new projects). It’s made using Kate Conklin’s Fussy Fairytales pattern. I remember that I was amazed at the neat way she has you cut fabric, but now I can’t actually remember anything about it. Hah! Since this was supposed to be a special event quilt (and also because I was more spendy then), I bought a fat quarter bundle of Monsterz just for it, and I just love the funny little ghosty guys! I’ve been wanting to baste differently in order to save on buying spray baste (plus, the last time I spray basted, I got a blister on my finger. How ridiculous is that! ), and Blair Stocker at wise craft happened to have recently posted about how she bastes with regular pins and craft foam as stoppers. It’s so awesome! I basted my quilt on the dining table without using clamps (I read someone else saying that the weight of the quilt hanging off the edges is enough to keep things taut; plus, I’m lazy) and it was so easy! I normally haaate basting, but this time I actually enjoyed myself. The bent sewing pins went in much, much more easily than basting safety pins, so there was no struggling with dull points, jabbing holes into the table, and ending up with great big holes in the quilt top. I also felt quite thrifty because I pulled my old, bent pins out and used those first. After those were used up, it was fun but weird to bend perfectly good straight pins! It only took half a sheet of the 6mm craft foam to stop all the pins, so that was nice and cheap, too. 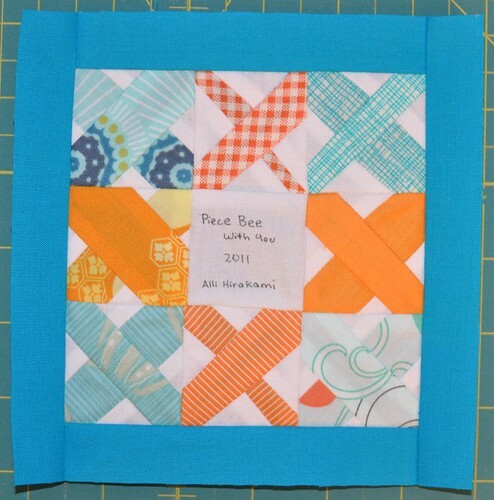 I never got jabbed while I was quilting the quilt, even though a couple of foam squares fell off their pins because I’d stuck them in off-center. I had fun making a temporary pincushion for my basting pins and foam bits — it looks even crazier than a normal pin cushion since the pins are bending every which way! I finally got to try out a fancy (for me) straight-line quilting pattern! This is the pattern I wanted to use for the Full Swing quilt, but wasn’t able to mark off properly. This quilt’s small, so I was able to use my hera marker and the dining table to mark the lines. Yay! I made the lines a non-fancy inch apart so the quilt would stay squishy. I machine bound the quilt, and you can really see in the unevenness that I don’t like to pin in advance. Oops! It is now the portion of the post where I shamelessly put up pictures of my kids because there happens to be a quilt under them. Oh, oh! My excuse is that I haven’t yet figured out how to take good pictures at my parents’ house (direct sun is too bright, shade from the house is too dark, and I haven’t figured out where there’s diffused light), but I seem to have an easier time fixing pictures with a person in them. Babies are better than blank paper for white balancing? I’m usually too much of a scrooge to want to make baby clothes (they use so much fabric! and babies can only wear them for a little while! ), but generous bloggy people have been sharing free patterns for them, and I got sucked in. When Rae released the 0-3 month size of her Little Geranium dress, I was all, I’m going to have a 0-3 month sized baby! Glowbug was too little for it when she was born, and then this week I noticed that she was finally the right size for it. She’ll probably fit it for two weeks, heh. I wanted to make my mom a library book bag and I liked Echinops and Aster’s spa bag, so I made this. The pattern makes a cute bag! I tried to coordinate the exterior with the book fabric, since my mom seemed to like it when she saw it in my bag, and I bought the interior fabric especially for her. I was a dork, though, and only vaguely tried to compare the dimensions to a pile of books before I started, and it’s kind of too small for a pile of library books! Doh. In other news, I made a tomte for Dawnybear’s present. Two Christmas presents, dun! This past weekend, we were invited to Mr. Yazoo’s sister’s friend’s son’s first birthday party. :> I’ve been feeling a bit of a pinch since I went kind of crazy with the after-Thanksgiving sales, so I made a superfast quilt (two days!) to go along with a little bit of money for our present. Since the quilt was so simple, I tried to spruce it up a little with more stamping. I was in a rush, so I machine bound the quilt. It was my first time! I used Crazy Mom Quilts’s terrific method of attaching the binding to the back, first. This way, the front looked tidy and the back wasn’t too bad! I totally copied the google turkey. :} Oh, and I almost misspelled “daddy!” See? On Saturday, I finished my Piece Bee With You block. I used Katy’s tip to use one of the templates to cut out all the pieces with a half inch margin, which was awesome. I was able to chain piece my four quadrants! My dad-in-law made me an extension table a little while ago, which I love using, especially when piecing stuff like this. I put a light under it and was able to see through the foundation paper pretty handily! I made my signature block using my new copy of Modern Blocks. (I was a little disappointed when I saw some slightly old-fashioned looking fabrics used for the sample blocks — I’m not very good at imagining things in different fabric combos so I love samples that use fabric I already like — but overall I think this book is fantastic!) It’s just a leeeetle too big, but hopefully Alisha won’t mind! … or The Reason My Bee Block Is Going To Be Two Days Late, Sorry Charlotte! I’ve been so focused on working on Christmas things that Halloween stuff slipped my mind. I had planned to have both the kids wear old costumes, but then it was October 29th and I couldn’t find the monster body for Sunshine’s outfit. Whoops! Instead of buying a costume I wasn’t really excited about (why do the stores with the super cute baby costumes only stock them in August?! ), I made a bapron like this one. This is a superhero bapron, so he’s got both his secret identity business attire and his cape. Bizness in the front and party in the back! I amazed myself again by taking alllll night to make what should be a super fast little project. I’m still really slow when I have to applique things — it took me forever to draw the N that I ended up using, and then I cut it out of fabric four times: first I forgot to flip it and then it was backwards; second I drew a different N, cut it out, then decided I didn’t like it; third I realized that the icy blue fabric I was using was too light, and fourth I cut out the dark blue one correctly. I also made too much bias binding really slowly. But Captain Sunshine’s ready to tag along with Cosmo and T tonight!